Gajanan Maharaj from Shegaon (Buldhana District), Maharashtra, India is a Saint from India. "Sant Gajanan Maharaj Sansthan" is the largest temple trust in the Vidarbha region. Shri Sant Gajanan Maharaj, Shegaon. The early life history of Gajanan Maharaj is obscure, his birthdate being unknown. Biruduraju Ramaraju has tried to establish in his collection of books called "Andhra Yogulu" that he was a Telugu Brahmin. Some speculate that he might have in fact hailed from Sajjanghad, (which was the place where Sant Samartha Ramdas had lived). Das Ganu Maharaj has written a 21 chapter biography, "Shri Gajanan Vijay," of Gajanan Maharaj in Marathi. 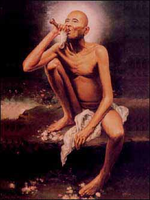 Contemporaries of Gajanan Maharaj identified him by several names like Gin Gine Buwa, Ganpat Buwa, and Awaliya Baba. However, it is amply proved that as a handsome, tall lad of 18 years old he arrived at Akkalkot to meet Shri Swami Samarth. It is said that on seeing him Swami Samarth was overjoyed and made him sit in his lap and caressed him lovingly; people around Samarth who watched this scene sait to Swami that the boy was in his teens and not a child. Thereafter it is said that Swami asked the boy to go to holy place of Kapildhara near Nashik and perform austerities. As per the instructions, the boy performed severe austerities at Kapildhara and attained Atmadnyana and became a Supreme Yogi. Just before his Samadhi, Swami Samarth asked him to get himself 'polished' from Dev Mamaledar (yet another disciple of Swami Samarth and a realized soul) at Nashik. The boy did exactly the same and got blessings of Dev Mamaledar. Later he was asked to keep walking and the place where he stoped would become his Karmabhoomi and the name given by people around him would be his name. This is what happened exactly. After Swami Samarth's samadhi, the boy appeared at Shegaon and as they say the rest is history. The evidence to this story comes from an old man who had seen the boy at Akkalkot with Swami Samarth and had come to Shegaon along with his son who was working in post office and was transferred to Shegaon. Maharaj accepting a human body is a mere pastime (Leela) as he is Brahmadnyani; that is why thousands of the devotees flock to Shegaon for his blessings. How he functions and transforms people from vile, wicked ways to great devotees is really unknown. None in his earthly days ever saw him chanting any special mantra holding japamala etc. But he is a supreme saint, whose blessings everyone must have. According to a legend, a money lender named Bankat Lal Agarwal first saw Gajanan Maharaj in a "superconscious state" on February 23, 1878 on a street. Sensing him to be a saint, Bankat took him home and asked him to stay with him. Legends say that in his lifetime, he performed many miracles such as giving a fresh lease on life to one Janrao Deshmukh, lighting the clay-pipe without fire, filling a dry well with water, drawing sugar cane juice by twisting canes with his hands, and curing leprosy of a woman. He took samadhi on 8 September 1910. A temple in his name is built on his Samadhi at Shegaon. For Shree Gajanan Maharaj Blog.